The way technology is sold to businesses has changed fundamentally in the last decade and as a result so has the role of customer support/success teams in helping to close sales. In the old world, potential customers rang a vendor to arrange a trial, a demo at their offices would be scheduled with a sales rep, and assuming that went well, negotiations about the price would get started. SaaS has turned all that on its head. Potential customers want to sign up for free trials, explore product documentation and talk to existing customers – preferably without having even talked to anyone at the vendor company. While the self service model has revolutionised the software industry, it’s not without its challenges. It’s dangerous to assume everyone can work everything out for themselves, to assume they want to work it out for themselves, or even that they will be able to do it themselves. Let me explain what I mean by looking at the typical sign up flow for a SaaS product. 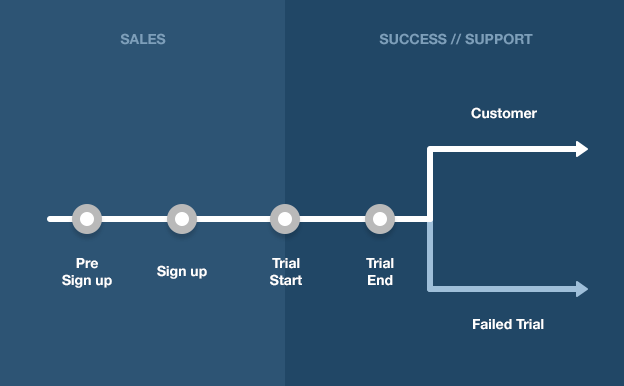 Sales are usually responsible for everything until the customer starts a trial, at which point responsibility passes to customer success/support. Most of the focus is on what happens when the trial ends – did they become a paying customer or was the trial a failure? We capture that kind of data in profit and loss centres and it’s no secret what’s normally seen as a profit and what’s considered a cost. So much for the outcome of the trial. What can be done during the trial to try and positively influence that outcome? Because if questions arise when someone is in the middle of a trial for a $449 per month plan, you don’t want to leave the response to chance. Who owns those questions? Sales? Support? Success? You offer trials to allow potential customers see the value of your product. But when a trial ends you’ll hear phrases like: “It’s too expensive”, “Once I get the time I’ll look at it properly”, “We don’t have that kind of budget”, “I haven’t gotten around to trying it yet”. All of that translates into one very simple reality – they haven’t seen the value of your software during the trial period. These people knew how much you charge when they signed up, so this is not just a question of your price – even if they say it’s too expensive. No, when they say it is too expensive, they are not necessarily talking about the price. In startups we like to think our products are getting better over time, that they deliver more value to customers every month as we make improvements and add features. So keeping a fixed cost over time is ridiculous. As your prices increase however, it becomes more challenging to explain the value of your product if potential customers just see a big monthly price tag. Before they sign up it’s the job of marketing to bridge the gulf between the value customers see and the actual value you deliver. You have the same issue once they start a trial. The value someone is getting may fall far short of the value you charge for. They may be using your product as a simple task manager but you are charging for a fully featured project management tool. This time your customer success team needs to bridge the gap. A good place to start is by doing a feature audit of your product. If you know what features are being used in your product you can build up a picture of what happy customers typically do. 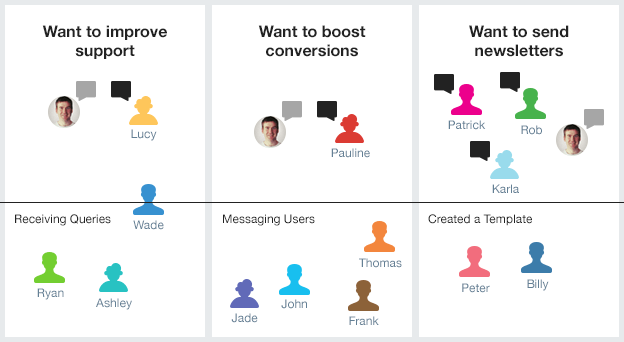 Intercom helps you to do this with a few clicks. Armed with this data you can decide what features of your product you should be exposing your trial customers to. What are the things that are most likely to help them see the value of your product? Another benefit of a feature audit is it shows if your product has become too bloated. You’ll know bloat when you see it – it’s features that aren’t being used by any significant number of your customers. Of course, if you’re in sales or customer success you might say bloat is not your problem but that’s not the case. You should think of bloat as non-monetizable features, rather than just being something that’s a problem for your product and engineering teams. Good products start with all the users using nearly all of the features. That grows the business and so you add new features. You’re convinced everyone is going to use the new features just as much as the original ones – because let’s face it no one thinks “let’s add some junk no one wants”. So what can you do during the trial period to prevent this from happening? It might sound a little glib but the job of customer success is to focus on what the customer needs for success. If that job is being done properly your customers will always value what they are getting from your product and you should see a chart like this. If you are unsure what success might look like for a particular customer? Ask them. 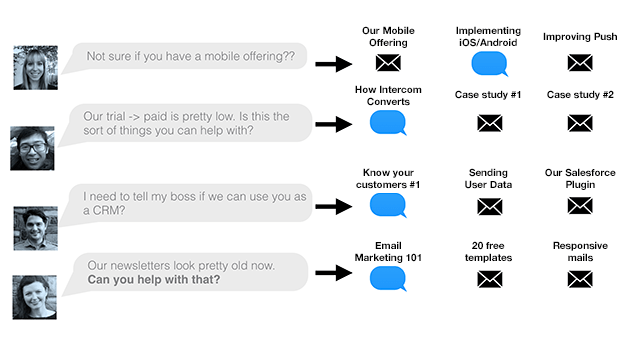 Let’s take Intercom as an example. Michelle may have seen our marketing site and thought Intercom looked like a good fit for her to send her weekly customer newsletter. The newsletters sent with her current system are starting to look dated. On a successful trial she would be able to create better looking newsletters. Nick has been asked by his boss to pick a good CRM. So during the trial he needs to find out if Intercom has all the features his team need. Jee read a case study which said we can increase trial conversion rates. He has a B2B SaaS app and the trial -> paid is pretty low. So he needs to improve that rate during the trial. Anita is close to buying Intercom but she needs to know more about the mobile offering. When viewed this way it becomes clear different customers have different definitions of success. Dumping them all into the same customer success flow doesn’t make any sense if you want to maximize your chances of converting them from trial users to paying customers. It is possible to learn how to predict, and so pre-empt, failed trials? You’ll need to be able to track a user’s activity over time – luckily Intercom is pretty good for that. The graph for a regular user will be pretty flat – by definition they use your product about the same amount of time on a pretty regular basis. Successful free trials are pretty easy to spot – the graph is going up and to the right, while failed trials start somewhere in the middle and head downwards in a pretty predictable fashion. Once they realise you’ve billed them, they’ll cancel, and that’s the wrong time to try and get them interested in your product. It would be nice if we got an alert every time a customer was in the danger zone – their usage is starting to decline but there is still an opportunity to influence them. 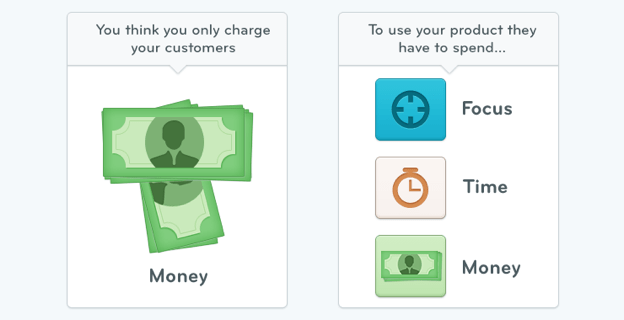 But real life is harder than that and it’s not easy to generate graphs like the one above for every single customer. So what do you do? Start by looking at people – rather than abstract graphs that measure things like pixels and pages. If 14 people start a trial of your product on a given day they are not all going to have the same definition of success. 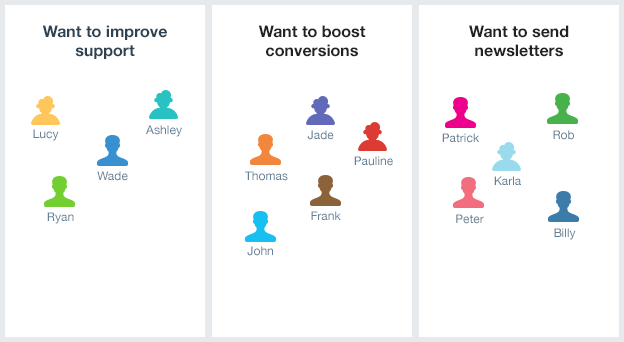 Four of them might want to improve support, another five might be looking to boost conversions, while the last five might just want to send newsletters. For each of those definitions of success you should have a corresponding action in your product that you expect successful trialists to complete by day three. For those interested in support it’s receiving queries, for those looking to boost conversations its messaging users and for the newsletter crew its creating a template. Using those rules e.g. “hasn’t messaged a user but signed up more than three days ago”, you can then reach out to the people who are getting stuck. For people trying out your most valuable plans that’s probably some form of 1:1 communication, while it should be 1:N e.g. an automated email, for common issues or for customers trying your lowest plans. You’ll manage to nudge some of these people to the first milestone but some you won’t. That’s just business. Now you need to think about what success looks like after 7 days? 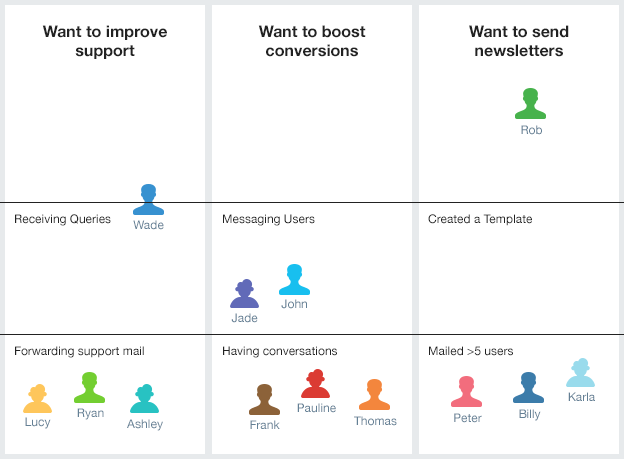 For the support cohort maybe it’s forwarding support emails, having conversations is key for your second segment and mailing more than five users will show that the newsletter trialists are on track. This can be tough but Intercom allows you to create the logic and automate the messages. And the results are more than worth the effort. The first step to successful free trials is knowing what “success” is for your customers. Once you’ve asked them that, you have to ensure you have targeted help, support, docs, tutorials and case studies to help them succeed. Finally you need a picture of what failure looks like, and once you see the tell-tale signs you need to step in to prevent it. Implementing all of this correctly isn’t easy. But get it right and when it comes to decision time, instead of hearing phrases like: “It’s too expensive”, “We don’t have that kind of budget”, you should be hearing “Did exactly what I need”, “Cheap at half the price” and “How did I do this before”. And that’s the sound of success.